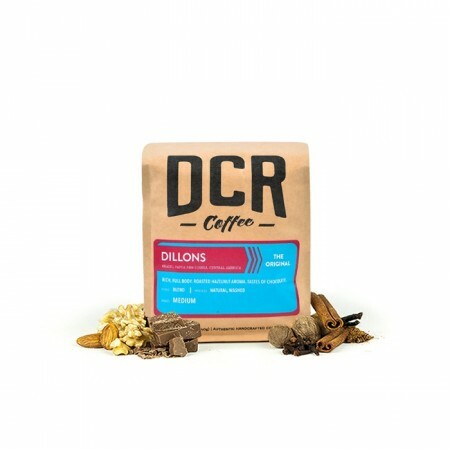 The Dillons was carefully roasted for you by Dillanos Coffee Roasters. With its milder chocolatey flavor, this original Dillanos blend is designed to appeal to a wide audience of coffee drinkers. This blend works great as an espresso blend or as a filter coffee, brewed as drip or French Press. Dillons Blend is rich and smooth with notes of chocolate and roasted nuts. Not a bad medium roast, but I much prefer a dark roast coffee. This was my favorite out of the six that I received as my gifted subscription this year. This coffee was much better than the last. Richer and less strong. Nice chocolate hint though a little burnt tasting rather than smokey. Didn't care for it much through a pressure maker but does nice as an everyday cup through a drip system. I enjoyed this balanced roast. If you like dark roasts, this is a must have. My all time favorite. Anything I rated a 5 in the past probably would be rated differently after I had this one. I liked it but it was the 4th DCR coffee in a row and I like variety so I get to try new coffees from all over. One of our favorites yet - strong and rich, yet definitely chocolatey and smooth with no acidity. This blend was a bit off. It had bitterness that was too strong for me and an interesting flavor. Not quite fond of this one. Solid coffee, like it a lot. Makes a very rich, very creamy, and nicely balanced espresso. Not bright and not bitter. This is my favorite espresso roast that I have tried. The midway blend has great taste and flavor. This one was perfect. More like it, please. I noticed that this blend seemed to be more bitter than the previous selections. You ended up brewing it at 10 degrees less water temp to avoid some of that bitterness. Not bad, but not our favorite. Enjoy the flavors, balanced and smooth. Prefer a darker roast, bolder profile. It was quite a bit lighter than I'm used to. The flavor was good, I just prefer very dark coffee. I could survive the rest of my days, happily, with no other coffee than this one. Excellent does not do it justice. Just about perfect. This was a little bit acidic, but it grew on me a lot and I really ended up enjoying it. Solid coffee. I'm not normally a mid roast guy, but this was surprising in a good way. It's rich and velvety, a tiny bit smoky. I went through most of the bag in a few days. Nice, simple roast. Overall this blend is a bit unidimensional, with a clean and direct chocolate top note. Was a bit disappointed that there wasn't any subsequent depth or complexity. Brewed easily in the press, Kalita, and Chemex. Good but not one we would try again. Good flavor, but a little light for my taste. Drinkable but boring. Pretty flat, lack of rich depth of flavor. This roaster is not my favorite. I've enjoyed this blend very much! Very smooth. We brew exclusively with a commercial espresso machine, and this was too light for our taste. 3.5, Intellegentsia like mouth feel but not as flavorful. tastes more burned than we like! Rich and smooth but lacking distinction. Good, but I have had better coffees. Not super flavorful in my opinion. It was a decent coffee blend. Although tough for me to characterize but the blend was a little dark for my preference. Apologies for the delay in review. Not a bad coffee, but weak tasting. I used the amount of coffee and water as recommended on the bag. I prefer a strong tasting coffee. The smell of this coffee is amazing. We loved the rich nutty and chocolate profiles. The strength of this coffee was excellent as well. Well balanced and generally just a great cup of coffee. Tried it in the French press and drip, French press really brought out the chocolate flavor I thought. There was a level of character to the flavor profile that was very rewarding to me. Yums. Doesn't taste like I'm licking an ashtray, good flavor and it's nice and smooth. Good stuffs. Flavorful, but a lighter roast. There is a bit of an almond pith finish that is somewhat bitter that I did not love, but that was a personal preference. We are just enjoying our first pot of this coffee, and we (as in, my husband and I) think it's quite good. Confession here - we tend to drink hot coffee with a dollop of whipped cream, which makes everything good. (We were staying with my sister once who, oddly, had no milk but a can of whipped cream, so there you have it). The coffee alone is good, it has a kind of strong, almost acidic taste to me. But I think it is growing on me. We have been drinking only iced coffee made with a toddy, but this has made me take out our 'Grind and Brew' again, with good results. Smooth, mild, and easy to drink; not bitter. I generally add almond milk to my coffee, and find myself adding less than normal than this in order to taste the flavors of the coffee. Good coffee with breakfast, not too dark. Very smooth, almost nutty taste. Flavorful but a bit too light for my tastes. This made an excellent cup in drip or Aeropress. I enjoyed this coffee very much! Normally I would pick this one off the shelf based on it's flavor profile but I wasn't a huge fan. Really enjoyed this brew, made it in my bonavita and it was perfect. This one was just ok for me. Maybe too mild? It seemed thin in taste, and a little bitter. Really good start. Excited for the next blend. Nice, however, it is a little weak for my tastes. I tried this in a french press and cold brewed. As described, I thought it made for a mild, approachable coffee which is both good and bad. While it made an above-average cup, there just wasn't anything that made it stand out as particularly noteworthy to make me recommend it more. By far my favorite in the collection so far. Light and smooth. No bitterness. Could drink it without adding any sweeteners. Smells delicious but don't love the taste. A more bitter coffee made better with creamer. I really was not a fan of this one. It was ok in a french press but whenever I tried to make it in my v60 pour over, it had a really bitter and earthy taste. Just not to my tastes for some reason. Like the nutty flavors and that there's no bitterness. Very easy to drink - a little too light for my liking but the nutty flavors were a great finish! The coffee is really good and I like the flavor, it's different than what I'm used to drinking. I would like for it to have a darker roast to give it a more robust flavor. Was very good. It didn't blow me away, but it was very tasty. Had a little bit of a bitter flavor on the end. A little boring. I like the richness, but too nutty for my taste.